When I begin working on putting together a My Obstacle Course, I choose my theme and then as part of my preparation, I usually head to Enchanted Learning to see if they have anything I can use to build literacy or math skills. This is an example of how I used one of their thematic vocabulary sheets, altered the look of it a bit and created an engaging station activity to build vocabulary! 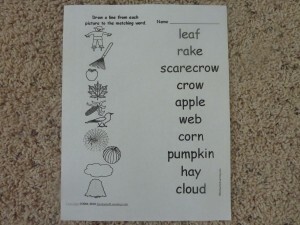 I began by printing off the sheet which is meant to be a “draw a line from picture to word” activity. While I love the pictures and the concept, as I mentioned above, I wanted something a bit more fun and interactive. 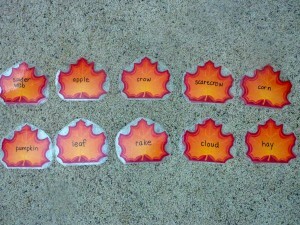 Autumn matching sheet (vocabulary and pictures) from EnchantedLearning.com. 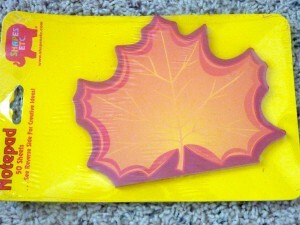 A pad of autumn-themed note paper. 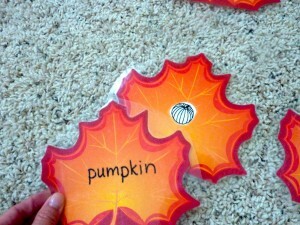 Cut out the pictures and glued them onto the sheets of notepaper. I chose to write out the words instead of cutting and gluing the ones from the original sheet but you could do that if you’d like. I laminated these with clear contact paper so they would be more sturdy and last longer, but you could also use index cards instead. Close up of what a matching pair looks like. When I set up the station activity for our Obstacle Course, I set out the pictures and put the words in a pile below (shown below). I did it this way because I wanted him to see the word, hear the word and be able to place the word on the picture. If you have a child who is already reading or is ready to build word reading skills, you could do it the opposite way and see if they can locate the word based on beginning sound or knowledge of how the word is spelled. 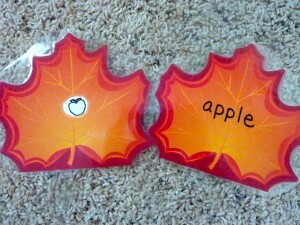 My Obstacle Course Station Activity: Match the word with the picture. 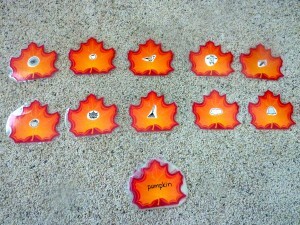 The word "pumpkin" matched with the picture of a pumpkin. This could also be used as a Crawl and Match activity (as we did in the station shown below). 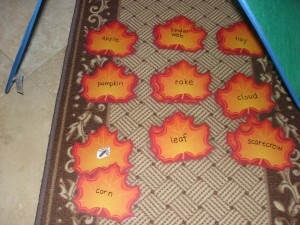 My Obstacle Course Station Activity: Crawl and Match the words with the pictures. It might just be me, but doesn’t this version look a bit more kid-friendly and fun than just sitting down with a sheet of paper? Still building same skills (minus the “drawing the line” skill) but much more engaging.